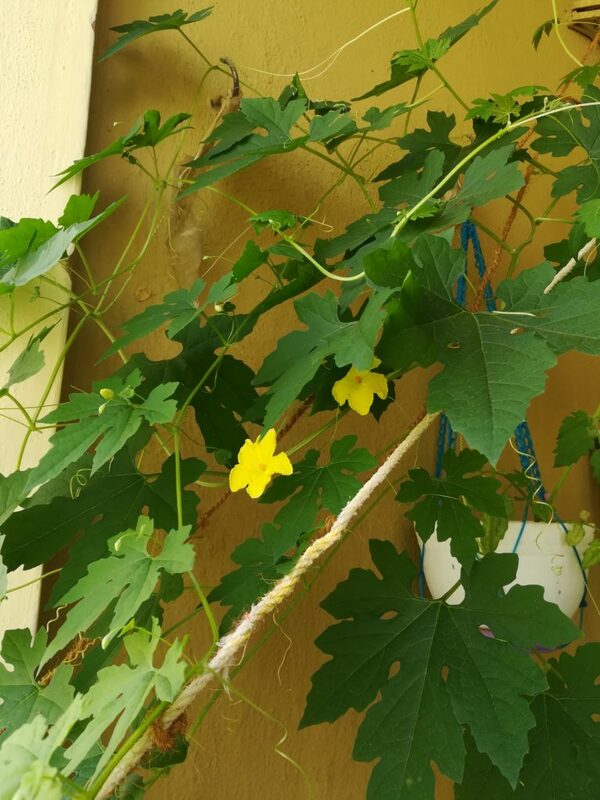 Balcony Garden – Bitter gourd flowers – I think.. I have a very messy garden going on in my two tiny balconies. I have two pots of curry tree and a moringa as permanent fixture, even though the moringa plant I have now is my third one. 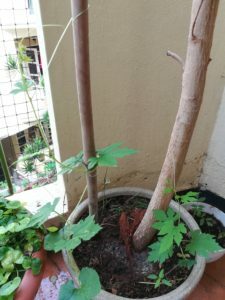 When the moringa grows too big for my balcony, I usually take the plant, pot and all, to my friend who lives in a ground floor apartment. At the moment I happen to have some bitter gourd/bitter melon plants in the bigger balcony. Momordica charantia, known as bitter melon, bitter gourd, bitter squash, or balsam-pear is a tropical and subtropical vine of the family Cucurbitaceae. The fruit’s quite bitter in taste, and is my least favourite vegetable. It’s kind of a ‘love it/hate it’ thing I guess, because I know so many people who are absolutely crazy about the thing, including my mother and brother. I do love the kondattams made from bitter gourd though. I guess I am gonna keep my plants, and maybe eat them if they fruit..:) Good thing, because these little things are packed with vitamins, and have almost all the micro nutrients you need. In April, my parents were here for a visit, and they brought some home-grown vegetables. My mother put some seeds she took out while cooking in the pots that already had other plants at the time. I am not sure when it was planted, but I began to see tiny seedlings by the end of April. 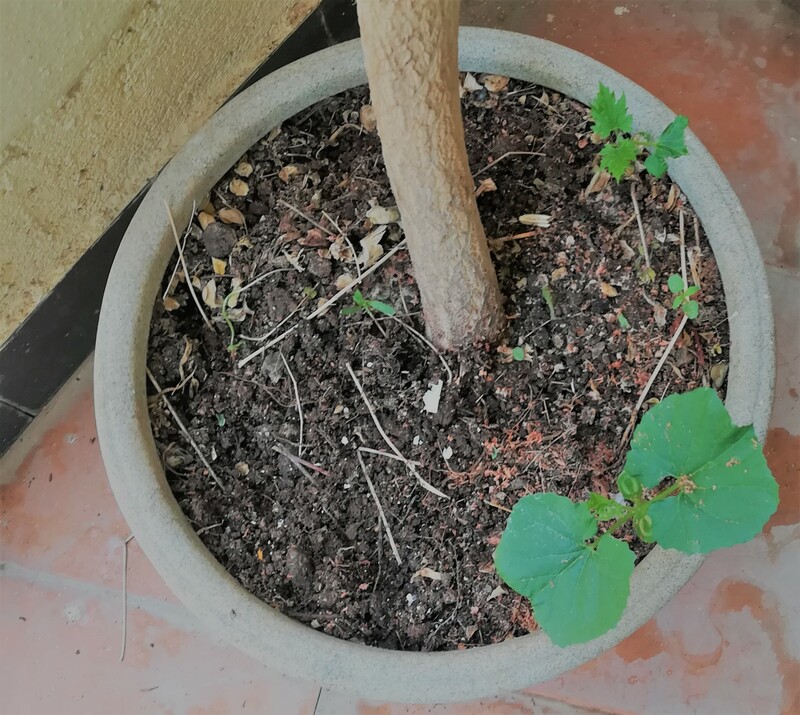 I see two tiny bitter gourd plants next to my moringa. I didn’t transplant or anything and am going to let it grow there on its own. I really do not have any other big pots to transplant. I water the plants once every day, and they seem to be going quite fast. They are fast growers, and I can already see tendrils. I added a support for it to start climbing and I love the tendril in action. It actually becomes a spring once latched on! I fertilize it with ‘ground nut cake’. These are the leftover cake like stuff you get to buy which is a by-product of making peanut oil. I soak it in water for a day and dilute it and use it for a couple of days. Be careful; they smell really really bad if left like that for more than a day. Keep it somewhere airy, and keep it closed. But they are a very effective growth tonic for almost all the plants. I do not have any compost/cow dung at the moment, so that’s the only fertilizer I used. I have added a few ropes to the balcony railing to let it climb. They are growing with a vigour and I see a lot of buds forming. 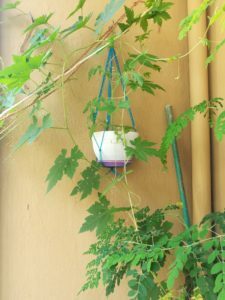 That’s my tomato plant in a hanging pot you see in the picture. The first male flower came on 29th May, and today I have two of them blooming. No female flowers as of now. It is becoming quite difficult to keep them from going to my pigeon nets — I have to break them off everyday. In hindsight I should have had a bigger trellis at the wall end from the beginning. I have read up on it a bit, and looks like the female flowers will start blooming only later, once the pollinator route is established by the early blooming male flowers. Keeping my fingers crossed!